Sadly - we will no longer be offering eggs to sell. we are leaving these pages up for our and your enjoyment. Our beautiful and healthy naturally fed & open range hens, 25 in all, furnish us with absolutely delicious eggs for our family and customers. In addition to their deep colored yolks and firm whites, their multicolored shells provide a rainbow of visual delight from light tan to brown, speckled, blue/green to lavender. 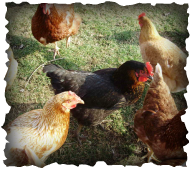 Our farmyard chicken varieties include, Rhode Island Reds, Black Stars, Isa Browns, and an Araucana. Some of their names are "Beethoven" our handsome rooster and chief protector, our red faced hen "Squanto", soft & pretty little "Sunshine", and an extremely curious and friendly dark golden hen - "Rapunzel", she actually prefers human company to chickens! Every now and then, we'll receive a present of a wonderful double yolk. Seldom if ever found in a grocery store egg, but not uncommon from our happy & healthy farm raised chickens. 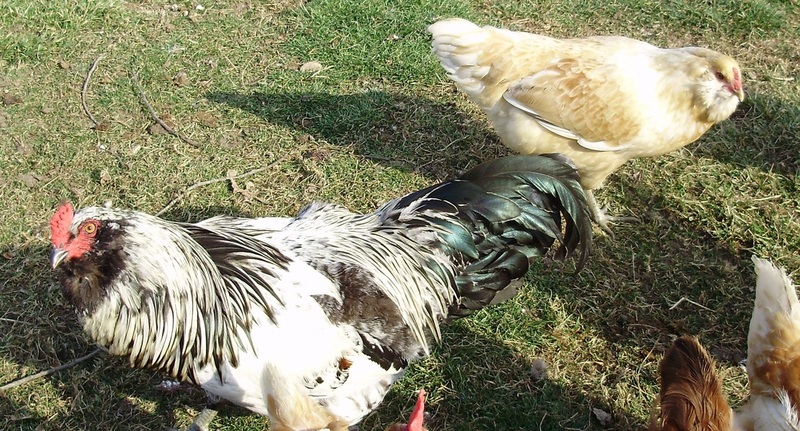 Beethoven our handsome rooster with Sunshine our yellow Araucana, behind him. She lays blue/green eggs. With fluffy scrambled eggs, to light and airy cakes, taste the difference our eggs also make in cookies, pancakes, omelets, sauces, cheese cakes, a fried egg sandwich and so much more.